So there it is. 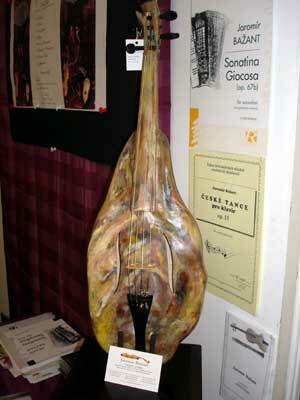 A violin, shaped like a fine leg of Serrano Ham, created by Jaromir Bazant, 'Maestro Luthier' of Valencia. The booth showing this was so keen to demonstrate his artistry that they had a real leg of ham displayed under the violin. this is the most amazing interface i have seen in a long time. How did you resist the 'porkestra' pun? Wow, great!, but c'mon, who can play that? I mean, the first thing I can think is to take a knife, and begin to eat!! !